I spend a lot of time on the Internet. Some days I look at hundreds of web pages—checking my e-mail, conducting research, purchasing products or services, working (of course) and countless other tasks. In the past, there has been a tried and true formula for the most efficient and reliable way to set up a web page—information was sectioned off in a logical order, appropriately categorized and sequestered in its own little section. Now, with the broader accessibility of the Internet across a wider variety of devices, how we access the Internet—and what we expect to find there—has changed, and the “traditional” structure is no longer appropriate to follow. Even at a time when there are so many digital opportunities to connect with users through social media, online events, and more, an institutional website remains the principal point of contact. To make the most of that interaction with your target you must create a website that will stand out, hold their attention, and encourage them to respond. You must treat your website as an opportunity to create an experience—not just as a clearinghouse of information with a prominently displayed call-to-action. As technology evolves, web development can support richer and heavier media, and we can use higher caliber media to help shape the online experience. I like to call websites that support this evolved user experience Experiential Websites. Here is a shout-out to some great examples from colleges and universities that have incorporated the changing role and structure of web navigation into their own websites. Experiential Websites do a better job than traditionally structured sites of helping prospective students understand the values, goals, and points of differentiation—the brand—of a particular school. Here are a few examples of websites that have embraced experiential navigation, structure, and content. 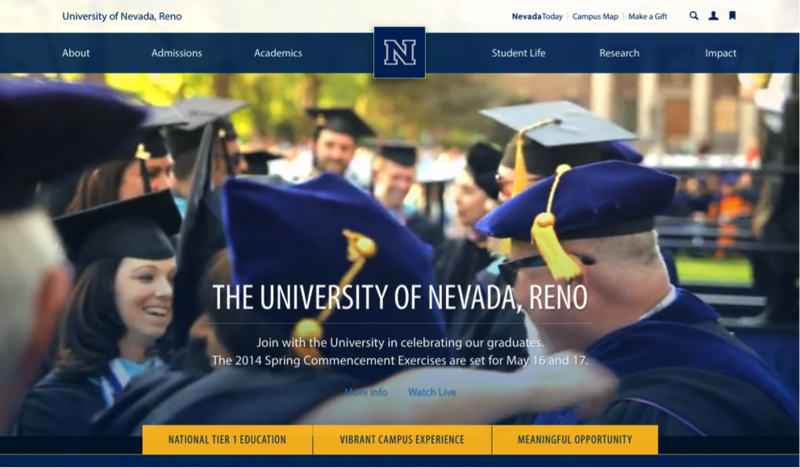 The University of Nevada, Reno is an excellent example of a website that captivates the visitor by using a dynamic, fun series of video reels that set the tone for the rest of the experience. Every section of the website is set up so that visitors can explore naturally, yet can still identify where they are and what they are viewing. By setting up every page with the same media, language, and structure, the University ensures that the user’s experience is not interrupted, and that they stay engaged past the first page. This site has taken full advantage of their explorative structure by including a call-to-action to “Take the Next Step” at the end of each section. This ensures that whenever the visitor is ready to stop exploring and start taking action, there is a logical place for them to go. Many of the same points above about the University of Nevada, Reno website are also demonstrated on Bucknell’s new website. 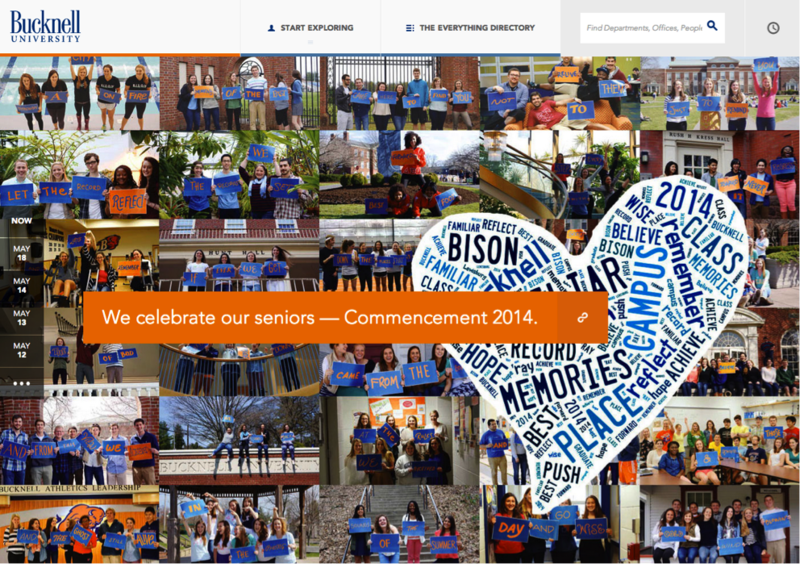 There is something unique to Bucknell’s site, however, which further breaks it away from the traditional structure of websites that we are used to seeing—site navigation is eliminated entirely. You can only imagine my level of excitement when I discovered that they’ve replaced the traditional navigation, About, Academics, Admission, Student Life, Contact, etc., with simply “Start Exploring” and “The Everything Directory.” How simple, elegant, and intriguing. Rather than provide visitors with the same information regardless of who they are or what they’re seeking, the entire site has been structured around the content that each particular visitor would want. These wonderfully considerate options are a huge breakthrough in website navigation, particularly for a college or university where many different audiences look for information every day. Not only does Bucknell recognize that every visitor is unique, but they acknowledge that not all visitors need the same information. On this single, visually dynamic page, the visitor is served only the information they select as being of interest to them. My favorite feature, and the one most applicable to institutions trying to woo prospective students through their online experience, is the ability to customize the content on the home page. It allows users to turn sections on or off, and remembers user preferences the next time they visit the website. This kind of customization goes a long way toward an enjoyable web experience for all kinds of users. It is important not to overlook the structure and content of Bucknell’s website as it relates to implementation of a marketing campaign. When developing campaigns targeting specific kinds of audiences, it’s not necessary to develop additional landing pages or micro-sites to make up for the one-size-fits-all institutional site; you can simply direct them to the page appropriate for that particular audience. I’d like to emphasize that there are many different ways to create an Experiential Website, and that is where a high-caliber creative team comes into play. However, the goals are always the same: to show visitors your brand –who you are and what you offer—rather than leaving it to their imagination, and to give users the best experience possible by allowing them to explore the information most important to them in a seamless way. The more Internet users become acclimated to these kinds of websites (sites that are, in essence, entirely about the visitors’ individual needs), the more they will come to expect this new type of structure that caters to their interests and navigation preferences. It is time to make your web experience a better fit for and more considerate of the people who use it.